For the first time after LG500 the company is produced a GSM-phone of the middle-level. 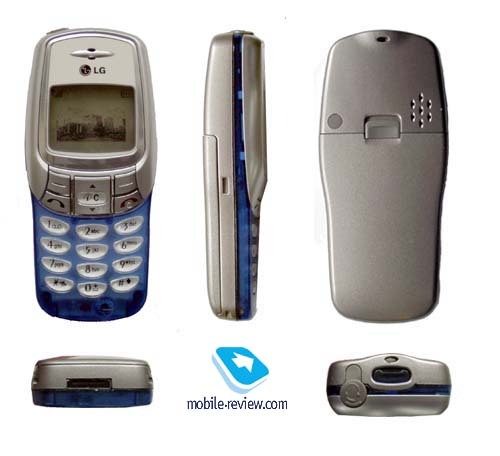 LG W3000 is aimed to young market, what determines the main capabilities of the phone. The handset measures 102x45x19.7mm and weighs 79g. 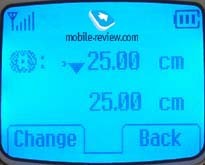 Such dimensions make the phone handy, you can wear it in the pocket of trousers or shirt without any problems. First, the phone was available in 3 colours: blue, red and white. It is necessary to add that the rim of the screen is always remained of silver colour. The lower part of the phone as well as the phone sides are translucent, it looks nice with the backlighting. The user can change the front cover if he want. It's easy to remove the cover, you even don't need to switch off the phone. The cover is reliably fixed to the phone, it has no backlash. In the contrary, the keypad can't be removed, it is built-in the phone motherboard. Unfortunately the interchangeable covers are not supplied now, though the company promised that they would appear soon and many colours would be available. The screen has a deep blue backlighting, it's rather bright but not irritating. The display has a resolution of 128x64 pixels, which usually enables to show up to 4 text lines. But in reality only two lines of information can be displayed, the other space is occupied by the service line and the tips to the soft-keys (which are very large). As a result, you can see only one phone number while viewing the phone book what is very inconvenient. 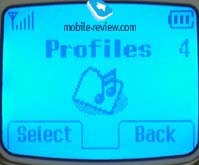 In the standby mode a date, time and an icon of current profile are displayed. The keypad made of plastic is placed under screen. The functional keys are well-spaced and comfortable to type. The keys are lighted form the sides and the symbols are clearly seen in all lighting conditions. The soft-keys are not so comfortable, they are too closely spaced to the send and reject keys. The most inconvenient are scroll keys, they have a typical form, but the engineers integrated a C key in the middle. Such spacing causes frequent confusion of the keys. A system connector is placed in the bottom of the phone, a cover locking catch and a handsfree connector are above. The hole for the strap, which is included in the standard kit, is also positioned here. If you look at the rear part of the phone, you can see a loud speaker - a playback of 40-tones polyphony. The battery holder is placed nearby. The battery is built-in the cover in this model, but its fastening is disgusting. After a week of using a small backlash appears and it increases then. I think it happens because of the phone construction, which doesn't have any grooves or horizontal holders, it is fixed only vertically. When you dial a number you feel a backlash, the phone creaks and scratches in the hand. We hope that the manufacturer will eliminate this defect in future. The phone has a lithium-ion battery of the 850 mAh capacity. According to the manufacturer it provides up to 4 hours of talk time and up to 250 hours of standby time. In reality the phone worked 5 days in case of 25 minutes of talking and minimal using of other applications. The full time of charging is 2 hours. 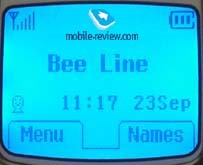 The phone has a traditional menu structure. You can see 8 numbered items in the main list. The submenus also have its own numbers what allows to use shortcut numbers. It's logical when only one item or icon is displayed in the main list but it's very inconvenient when you can see only one item in the submenu. You should frequently scroll the list to access a necessary application. 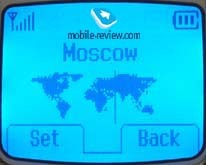 Before we turn on to the features description I'd like to notice that W3000 has a predictive text input - eZi Text (for English and Russian). Phonebook. It's possible to store up to 200 phone numbers in the phone memory. 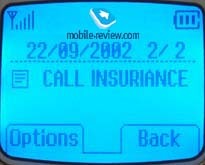 You can add up to 4 phone numbers to the one contact (home, office, mobile and fax) and 1 e-mail address. 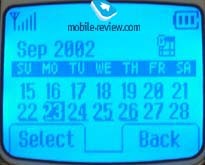 The phone has a serial date input, you can't skip one field and fill in the other. Anyway, only one line is displayed on the screen. 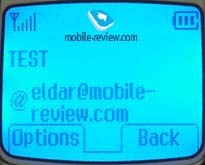 The phone numbers from both memories (SIM-card memory and phone memory) are shown on the display. 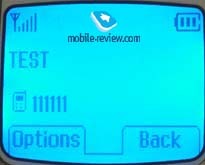 Each number is indicated by the digit or memory type. There is a search by names and cell location. 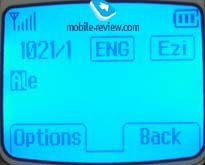 You can create caller groups (up to 7) and associate the own icon (up to 18) and the special ringing tone to each group. It's also possible to add a voice tag to l0 phone numbers in the phonebook. The voice dialing is realized great in this model (it's typical for LG). You can't create recurring voice tags, the recognition is good even in noisy places. The user also can assign a phone number (up to 8) to one of the speed dialing keys (2-9). So, that's all about phonebook capabilities. Messages. 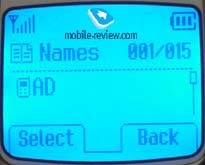 Up to 110 messages can be kept in the phone memory of W3000. The phone has 11 templates, 7 of which are pre-default. 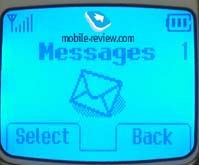 The handset support concatenated messages (up to 1024 characters). When you create or read messages you can see two text lines, not one, as usual, on the screen. It's better, of course, but doesn't improve the situation. The interesting feature is a possibility to create a business card and to send it via SMS. The other possibilities are common. Phone support Nokia Smart Messaging. Call lists. There are traditionally 3 lists here: of missed, received and dialed phone numbers. 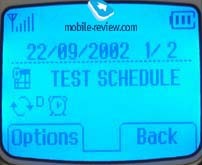 Each list contains up to 20 phone numbers with date and time indication. If you press a send key you can view a general list of the last 20 phone numbers. Call divert. Nothing interesting here. Profiles. There are several profiles in the phone. Each profile can be personalized (a ringing tone, its volume and the vibrating alert). You can choose a standard tone or a vibrating alert for short messages, no other variants. You can set a type of incoming alert. Besides the ordinary ones two more types (mixed) of incoming alert are possible: a vibrating alert and a ringing tone afterwards and vibrating alert with a ringing tone at once. Settings. An alarm clock (daily, weekly, monthly and alarming at once) can be setup here. It works when the phone is turned off if you select this option while setting. The interesting settings are screensavers (4). I liked the one with panda most of all. The contrast can be adjusted here, it works correctly in the contrary to the other entry-level models from LG. The information is visible now when the values are extreme, it doesn't disappear. Organizer. You can store up to 20 appointments in the phone memory. The calendar is displayed but only two weeks are shown at once. It's a pity but you can't go to a necessary date, you should scroll the calendar to view it. But it's possible to view all appointments in one list, the events of one day can be displayed in one list too. Two types of notes are supported by the calendar: Event or Note (a small text). One can set a reminder for Event, but it's impossible to do for a Note. Accessories. World time, calculator and unit converter (length, weights, squares) are placed here. 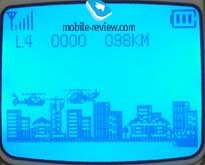 You can also find 3 games in this submenu: Mobile hawk, Crazy Race, Stone Axe. We've already seen the last two games in the other models, the first one is a kind of Arcade, where you are a pilot in a helicopter. The peculiarity of the phone is that the backlighting is turned off in the beginning of the game to save the energy. You can turn it on pressing *. Internet. WAP-browser (version 1.2.1) is positioned in this submenu. There are no claims to the quality connection. The volume of the loud speaker is very strong in the talk mode, you can even decrease it. The ringing tones are loud, they can be easily heard in the noise streets. According to the manufacturer the phone has 40-tone polyphony (only for Russian market, for European phone has 16 tone ringer), but in my opinion, the ringing tones resemble ones of Samsung S100 (the volume and the melodies). Remind you that Samsung has 16-tones polyphony. May be I am mistaken but it seems to me that W3000 has the same polyphony. Here you can listen to the examples of the polyphonic ringing tones of W3000. The vibrating alert is rather strong, you can feel it when your phone lies in jacket or in case. The main shortcomings of this model are horizontal backlash of the rear cover and a little display, which can show only few lines. No other considerable problems were found here. Today the phone costs about 200-210$, it's rather expensive for the handset of the middle class. But if you take a polyphony into account you find no rival models in this market segment. We think that W3000 will be very popular in its target group, firstly because of the polyphonic ringing tones.